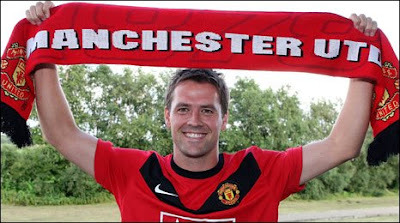 Manchester United have surprised the football world with the signing of Michael Owen. Hear Owen's news conference here. A free agent after ending the season out of contract at Newcastle, Owen's earned a major chance to consign to history a difficult few seasons since returning to the English game from Real Madrid. It's been a particularly torrid twelve months. He's battled with injuries and Fabio Capello just won't pick this one-time England regular - even for his wider squad. But when he plays, he scores. And the bigger the opposition, the more likely Owen will ma ke himself count. So where better than Manchester United with their capacity for high-drama at a high-level for Owen to resume that career? He deserves this move on his track record. People are quick to write off players given the instant demands on them to perform to match their astronomical wages. And it's true that Owen has battled with long injury layoffs and losses of momentum. But he rarely battles with goalscoring form; he has a proud record. When he plays for a sustainable period, his goals-to-appearances ratio match most. It's just the amount of games he plays that's lacking. Sir Alex Ferguson recognises that and has given Owen a deserved final shot at the big time. It's an opportunity I'm sure neither Owen nor his advisors expected, especially when circulating a glossy brochure on him around the football world a few weeks ago! But now Owen must prove he can sustain his match-fitness to the levels he enjoyed three years ago. He must stay fit and work on the aspects of his body which are exposed to physical weakness. If he can do that, he'll match the player he once was, skinning the Argies in '98, smacking a hat-trick in the Germans faces in '01 and coming off the bench to score two late goals to lift the FA Cup for Liverpool in the same year. If anyone can, Owen can. here here! And credit to fergie for being brave enough to stick his neck out! Quite right Jonny- there's never been anything wrong with Owen's goalscoring ratio, but he's had a horrible run with injuries during the last five years. I think he'll be a success at Manchester Utd, because even if he's lost some of his former pace, he'll receive the support he needs from his team mates to show he's still one of the best finishers in the game.